If you're just starting or want to expand your chord knowledge then Essential Guitar Chords eBook features 300 real-life examples. So, Whatever your playing ability, your chord knowledge is about to expand! Essential Guitar Chords eBook is a reference you can't live without. Split into 12 sections. There is a chapter on each of the 12 notes of the Western chromatic scale. 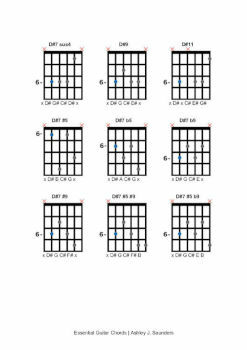 Each chapter looks at 25 chords. This means that this eBook features 300 guitar chords. All of which are essential! 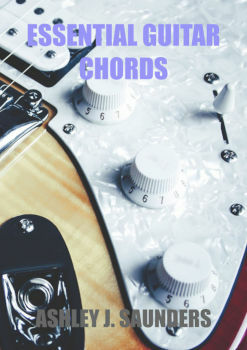 While some chords book are written by guitarists who are being paid by the chord and therefore contains a number of unuseable examples, this eBook will only show you real-life guitar chords that you can use straight away. 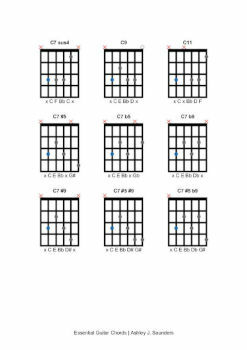 Also this ebook is fantastic if you're just starting out as it will teach you all of the guitar chords that you need to know. 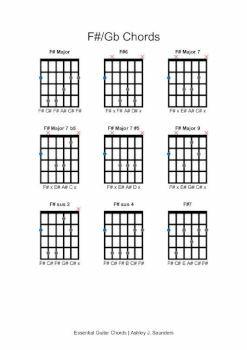 From basic open chords to more complex bar chords. If you're self-taught and know the basics, then use this eBook to expand your chord knowledge. So move beyond same simple chords you always use! Even if you're advanced, you'll discover some that you don't already know. It's always good to expand your knowledge! When you find a new chord try to use it in a song straight away as this solidifies your knowledge and moves the grip from your short-term to your long-term memory. Also, this method will force you to make the change quickly and enable you to use the new chords in a real-life situation. If you're self-taught and want to improve your knowledge of guitars chord then this eBook is aimed at you!